A few months ago, I had the desire to write up a post on a certain topic but, for some reason, completely forgot about it. Well, I read an article on Tokyohive that reminded me about the topic I wanted to write on, and, considering that Niigaki Risa's graduation is nearing in a few months, now is better than never. Just after Takahashi Ai's graduation from Morning Musume, I read on one of the fan wikipedia's for Morning Musume that a 7th sub-leader hadn't been chosen for the group. This was surprising, but I really wasn't prepared for what I had read next - Apparently, Tanaka Reina was to become the sub-leader instead of Michishige Sayumi, but in the end Tsunku chose neither, as he predicted conflict. So, in the end of it all, no sub-leader was chosen. When I finished reading that, I was ready to write up a blog post or a very long rant on why Reina shouldn't be the next sub-leader, and why Sayumi deserved the position rather than that winking cat. In the end, I simply forgot about it and didn't think twice about the situation, somewhat making myself believe that Sayumi would become the next leader regardless due to being the second oldest in Morning Musume. Well, my insecurities have returned thanks to the Tokyohive article that I read today. In the article, Michishige Sayumi was claimed to have stated that she wished to become Morning Musume's next leader, as she feels that it is her time and that currently, the new leader has not been discussed, so she expresses her wishes to gain that position. And when I read that, I knew then that I really wanted Sayumi to become the leader, and not Reina. I guess it's down to personal preference, but honestly, I do feel that Sayumi would be better fitted as the leader than Reina is - she is a lot more friendly with the other members as far as I know, and helps them out as best as she can. She appears on TV a lot, and is pretty much the spokes person for the group that she loves so much. She is much more than a pretty face, and has already proven herself to be a reliable and capable young adult in such situations, so yes, I would love to see her become a leader. But what kind of makes me think about what will happen is more so the comments on this topic - there's a divide when it comes to those who want Sayu as a leader, and those who want Reina as the leader. Some people think that Sayumi already gets enough attention as the resident camera whore of MM, so feel that she just deserves that sub-leader title and to look pretty beside Reina as the leader, whilst others feel that Reina deserves it more because she is the face and voice of Morning Musume. Honestly, these comments... I really hate them, but that is probably because I have a soft spot for Sayumi. She isn't my favourite member of the group, but I seem to relate to her more than the other members in a personal way. I especially hate the comments that state that Sayu should not be a leader simply because she has a lot of camera time in Morning Musume, as well as claiming that she would steal everyone else's spotlight because of this fancy new title, and that Reina deserves it more because she is better than Sayumi at singing. I know that people have different opinions on the matter, but there are a few shallow comments on this situation - and it is mostly concerning how Sayumi shouldn't be a leader because of how much better Reina is, and how Sayu gets enough spot light already. Well, in my opinion, I think that Sayumi deserves this much more than Reina. She has worked hard to become what she has, to get that position in Morning Musume where she is at the front, singing lines that were made for her. Reina has always had a front and centre position from the day she started, whilst Sayumi herself has had to make her own road from scratch in order to get to where Reina is right now. Also, Sayumi is currently the only member (other than Eripon, in a way) who happens to be on TV a lot. She is shown on different TV shows, and recently was cast in two different drama's (one for MoBeKiMaSu, and another where she is a spoilt sister) as well as becoming the image character for SANRIO and a character on the Dragons Nest MMO where she played as an Idol character. As well as that, Sayumi also helped to produce her latest photobook, where she was able to choose things that she wanted and to show a different side to her usual cute self, and show a brand new Sayumi for her fans. This just shows how much control Sayumi can have, and how big she is with the Media. Right now, she is one of the only connections to TV for the group - and Reina does not have that. Whilst Reina is the most popular member of Morning Musume and the face of the group, she probably isn't as active as Sayumi is when it comes to the Media. Yes, she is popular - but the public seem to adore Sayumi more as a tarento than they do Reina, because if they really did adore Reina just as much, wouldn't she get as many appearances as Sayumi does right now? In the end, it is the wota that love Reina - but it's the public (mostly kids, as far as I know) and the wota who like Sayumi. In the end of it all, whoever is chosen as the next leader is Tsunku's and UFA's choice, and not ours. There are probably a lot more people out there who, like me, want to see Sayumi as a leader, simply because she deserves it. The girl has had to push and pull her way to the front from the beginning and has had to make herself noticed, whilst Reina has just had to sit back and relax because it was all done for her. I feel like it is Sayumi's time to shine as someone who isn't 'cutesy' or 'annoying', but as the leader of Morning Musume who will continue to promote them and show everyone that Morning Musume is a great group. 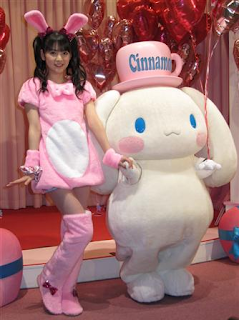 These videos are from the release event of the Valentines chocolate that Sayu collaborated with as 'Sayu Usa'. This is where she expressed her desire to become the next leader of Morning Musume, too. Honestly, I feel the same too - but apparently, when Ai graduated, there was talk of Reina being sub-leader instead of Sayu, and now that Tokyohive brought the dead topic back to zombie life, comments have come in which are pretty divided, so I was like 'Hey! Time to bring this up! grrrr'. In the end, I am biased towards Sayumi, however I do know that she has an advantage here with how public she is as opposed to Reina. I honestly think that the leader of H!P would become Saki. I don't think that UFA should make Sayu the leader of H!P - I love the gal, but really, I do go for the seniority part of it all. Actually i think Sayu is more popular than Tanaka. i know i shouldn't trust Mixi rankings but last month they showed that Sayu is the most popular in MM with Tanaka under her. I aslo think that UFA give girls PB's based on how popular they are/who they are trying to push. Sayu has been getting a solo PB every year since 2007 while Tanaka hasn't had one since 2008. The only reason why Tsunku and UFA don't give her loads of lines in singles is because she isn't a good singer. I bet that had Sayu had better vocals, She would have been fighting with Tanaka for lines in singles. @Nia, As much as i want Captain to become H!P Leader, 6th Gen debuted before she did. I just realised something, What if Tsunku is planning on graduating them both together? Makes sense that they wouldn't announce Sayu or Tanaka as the next leader if they are planning this. They might make them become Co-Leaders of MM and H!P until they graduate. Thanks for this info! I didn't really know that Sayu was THAT popular, but then again, it isn't surprising, considering she is like, always on TV and such. I was just reading this for the first time, and i am very happy now that sayu is th leader, but what i want to know is what is going to happen when they are both gone. Will Mizuki become leader because of seniority and being the oldest in 9th gen or will Haruna, as she would be the oldest in the group but, would be 10th gen.